Here's the latest on my sister. There's a short write-up from my Dad, below, and pictures on the second page. Please be advised that the pics are not for the squeamish or the faint-of-heart. They're no worse then prime time television, but the face is more familiar. watching that. Nothing to worry about, just very interesting. probably because of the medicine. They will move her to a room on the neurosurgery floor about 5:00 today. around her jaw, so chewing is still a problem. be medicine, could be because someone's been messing with her brain. All in all, we're seeing progress. For those who haven't heard yet, my sister is having brain surgery today. She'll be in surgery around 12 noon today. 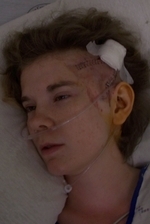 The surgery is intended to prevent the seizures she's dealt with for the past 8 years or so. She's tried various medications, but nothings really prevented them completely. Our hope is that this surgery will prevent the seizures completely. Please pray that the surgery will go well and that recovery will be smooth. Does this screenshot bother anyone else? Just had a "run in" with a 1and1 hosting policy. A client of mine had a 1and1 hosting account, that account came with a free domain name. When the time came to move the clients web site over to our hosting service, we did the usual steps of transferring the domain name and changing the name servers. We had intended to keep e-mail hosted with 1and1 along with a few large files. However, 1and1 has a policy to delete all data associated with a domain when that domain name is transfered. In this case that meant that e-mail went down during the transfer, and if the users had not been using POP all their e-mail would have been lost. Along with this, 1and1 keeps no backup for shared hosting accounts. So there was also no way to recover. Leaving us with a frantic moment of panic and setup changes. For the record, if you are in need of inexpensive, high volume hosting that you may eventually (like during your lifetime) want to change, consider using a provider other than 1and1. Until they change their policy (which is unlikely) they should not be trusted with your data. Your data is too important to be lost that easily.